The slowdown of economic growth in the eurozone has been sharp as a number of one-off factors drag on activity, but the ability to rebound will be limited, according to Oxford Economics, which argues the group of 19 countries has been operating at close to its economic potential. Growth of just 0.2% in the fourth quarter of 2018 was the latest in a series of disappointing data releases in the eurozone, with Italy entering into a technical recession and Germany, the regional powerhouse, only narrowly avoiding a similar fate. 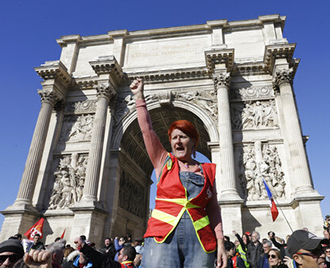 French protesters have taken to the streets, highlighting economic discontent in the region. Annual growth in 2018 of 1.8% paled against 2017's 2.5%. The slowdown appears to be broad based with weakness in industrial output and the consumer sector. EU emissions tests badly hampered the German automotive sector, while violent anti-government street protests in France have hit domestic consumption, and for the entire region, global trade tensions are damaging supply chains. Since the first quarter of 2018, the consensus opinion has been that the drags on European economic growth would be temporary, but Rosie Colthorpe, assistant economist at Oxford Economics, a U.K.-based global forecasting company, argues that contractionary fiscal policy at the height of the 2008/2009 financial crisis set output, both actual and potential, on a "permanently lower path." "The eurozone economy is now operating close to its productive potential, even though it has lost the equivalent of Spain’s GDP compared to pre-crisis trends," Colthorpe wrote in a recent report. Colthorpe argues that having allowed the capacity of the growth in the region to decline in crisis years by avoiding significant fiscal spending, governments now have little room to stimulate without causing inflation. "The euro area potential output growth rate has fallen to 1.5% from 1.8% prior to the crisis, so what would have been seen as sluggish growth is now in fact the new normal." Wells Fargo cut its GDP outlook for the eurozone to 1.5% for 2019 and 1.4% in 2020, from 1.6% and 1.5%, respectively. "Even if the euro area avoids a near-term recession as we expect, it is hard to get particularly excited about the region’s growth prospects," wrote Erik Nelson, a macro strategist at Wells Fargo. Colthorpe suggests the lost potential output stems from a "permanently lower labour participation rate, a large productivity shock and a lower capital stock as both governments and businesses slashed investment spending." She also acknowledges that growth in the run-up to the crisis may have been unsustainable, distorted by an "exuberant financial sector." While austerity took precedence over fiscal stimulus in much of Europe, the European Central Bank swung into action, cutting interest rates and introducing quantitative easing to boost business conditions. ECB President Mario Draghi has long pressed for fiscal policy to support the accommodative monetary policy. David Owen, chief European economist at Jefferies, said it was then down to governments to boost the economy. The ECB "would turn around to the politicians and basically say, 'We bought you time, we stopped the system breaking apart. You didn't actually fix the roof when the sun was shining.' Germany is still running a current account surplus," Owen said in an interview. The latest data from Eurostat shows that overall the eurozone is exporting more than it is importing amid weak domestic demand, recording a current account surplus of €20 billion in November 2018. In the 12-month period to November 2018, the total surplus was €353 billion, or 3.1% of GDP. "The eurozone is running a current account surplus that is basically the same as the U.S. deficit," Owen said. According to S&P Global Market Intelligence data, the U.S. current account deficit was $449.5 billion in 2017. "One of our major themes has been that the eurozone current account surplus has been effectively supporting U.S. and U.K. bond markets. Half a trillion [dollars of] net buying of debt securities." Oxford Economics calculates that every 1% of fiscal policy-induced decline in 2010 and 2011 GDP led to a 0.6% fall in potential output by 2016, and 1.3% by 2021. "The lessons for the next downturn are clear: counter-cyclical policy should be more aggressive to prevent permanent output losses," Colthorpe said, but noted that a boost in fiscal spending now "is not potent enough to push the economy all the way back to its former path."